The Egyptian Queen is a Collectable Minifigure released in 2011 as one of the sixteen minifigures from 8805 Minifigures Series 5. She features a green snake as an accessory and a new black hair piece with a headdress printed on it, and her eyes are accented with blue eye liner. She also wears a sloped piece in place of normal Minifigure legs to simulate a dress. The Egyptian Queen has a white dress with a horizontal gold stripe at the bottom and several lines going downwards. At the top of her dress is are two lines going outwards and then two more at the ends of those going back inwards and joining together. This shape is outlined in light blue squares and gold in the middle with a light blue jewel near the end. Her torso is white, and she has yellow arms and hands. She has a golden belt with a light blue circular gem in the middle and wing markings coming out from it. Some more light blue and gold printings show the start of the shape at the top of the dress. At her sides, the Egyptian Queen has black half-oval printings to show her waist being thinner than normal minifigures. The Egyptian Queen has a golden plate neckless with a picture of a bird on it with its wings outstretched. The Egyptian Queen's head is yellow with black eyes, white pupils, and long eyelashes. Above the eyelashes is some blue printing and then two black eyebrows. The Egyptian Queen mouth has a black smile with orange lip printings on it. She has a long black hair piece and markings above her forehead light those on her belt. The Egyptian Queen comes with a green snake as her only accessory. 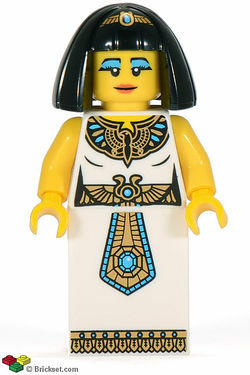 The Egyptian Queen is featured as a Master Builder in The LEGO Movie, and is assumedly a resident of Cloud Cuckoo Land. This is a description taken from LEGO.com. Please do not modify it. (visit this item's product page) The Egyptian Queen is used to the finer things in life, but don’t think for a moment that it’s made her soft! She may have a golden throne, banquets five times a day and legions of loyal servants to obey her every command, but she also knows all about tax codes, crop rotation and pyramid construction regulations, not to mention the ancient game of politics. The Egyptian Queen is used to the finer things in life, but don’t think for a moment that it’s made her soft! She may have a golden throne, banquets five times a day and legions of loyal servants to obey her every command, but she also knows all about tax codes, crop rotation and pyramid construction regulations, not to mention the ancient game of politics. The Egyptian Queen loves to disguise herself as a commoner and listen to what her subjects are saying about her. Of course, since everybody knows what she looks like (she’s on all the coins and statues, after all), they’re always careful to say only nice things. It isn’t too hard, since for an all-powerful sovereign, she’s really not too bad! This page was last edited on 18 June 2017, at 20:05.